The National Museum of the USAF CONSTANT PEG MiG-23 Display – Gaillard Peck, Jr. The National Museum of the Air Force has now included a CONSTANT PEG display which includes one of the actual MiG-23s flown by the pilots of the RED EAGLES from the airfield at the Tonopah Test Range in Nevada. This aircraft along with MiG-21s (and MiG-17s during the early days) was a part of the AF air-to-air combat training program which in addition to AF aircrews also included, Navy and Marine Corps trainees. Both Navy and Marine pilots also flew the MiGs as instructors along with their AF hosts and fellow fighter pilots. In the nearly 10 year operation over 15,000 MiG sorties were flown and over 6,000 American fighter aircrews were trained to fight and defeat the MiGs. Other facts and memorabilia are included in this fascinating and expanding display.Outside the National Museum of the Air Force at Wright Patterson AFB is a monument garden. 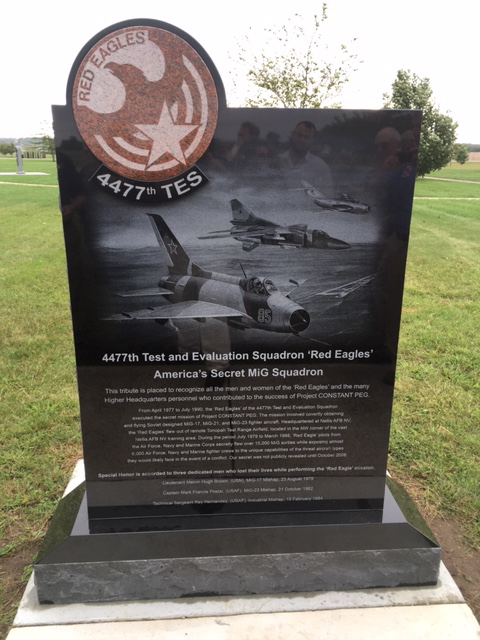 The RED EAGLES dedicated a monument in Sep 2018 and a representative group of RED EAGLES attended both the dedication of the monument and the public introduction of the indoor display, which included the MiG-23. in the garden at the National Museum of the Air Force. 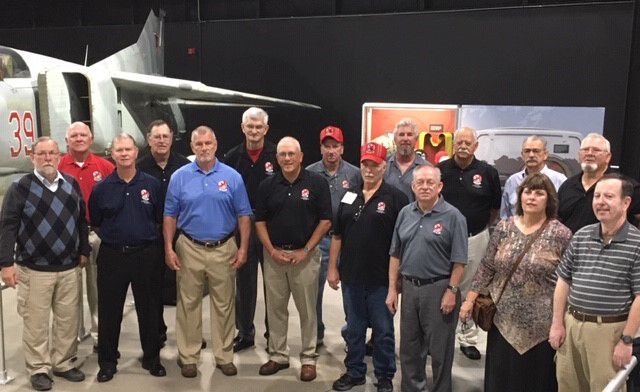 Representative group of RED EAGLES that attended the event at the National Museum of the Air Force. I am on back row third from right. Col Mike Scott, our Alumni President and the last commander as well as a Captain I hired on my watch is front and center in black shirt without hat -4thfrom left. Mike had two tours with the RED EAGLES. Others include pilots, maintainers and other support folks. B/Gen (ret) Dave Stringer, back row third from left was one of our maintenance officers and one of the few that became Flag officers (generals or admirals).